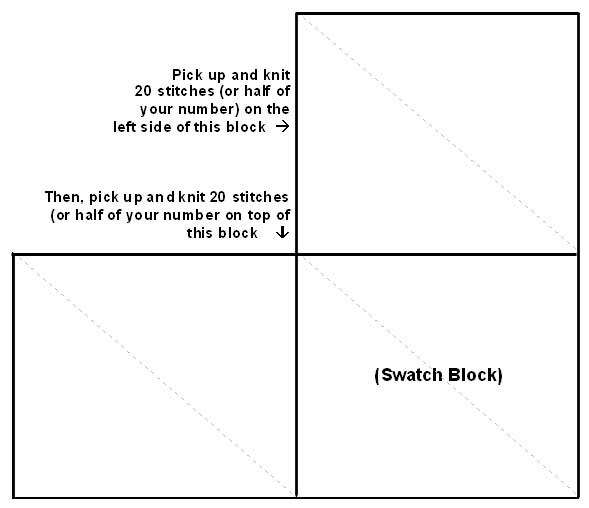 Okay, by now you may have your first strip of blocks completed = 13 blocks, and you're ready to start the second strip. 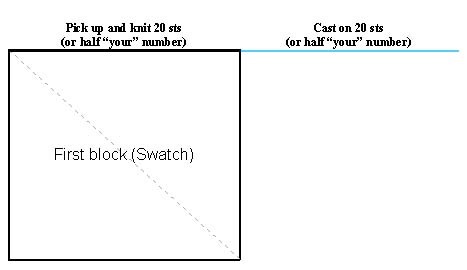 For the first block on the right hand side you will cast on 20 stitches. This is half of the total number that you need. (Your personal number may be different if you made adjustments). 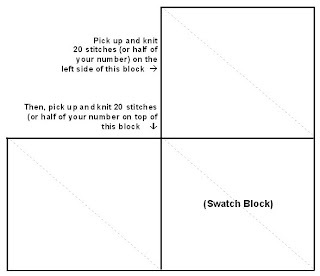 Then, with right side facing, pick up and knit 20 stitches along the top of the first block, the swatch block. Turn. With wrong side facing, slip first stitch purlwise, knit to the end of the row. From here on you'll work the block the same as all the others. Next block (strip 2, block 2): With right facing pick up and knit 20 stitches along left side of previous block and then 20 stitches across top of block below. Turn. With wrong side facing slip first stitch purlwise, knit across the row. Turn. Continue as with other blocks. You know have the methods for all the blocks and can continue to the end of the nineteenth strip. Weave in the ends. On October 15th we'll talk about the border. For questions and discussions, please visit our Ravelry group. If you find errors in this post, please email me at: joanne @ jconklin . com (remove the spaces) so I can correct them.